KOP THAT! 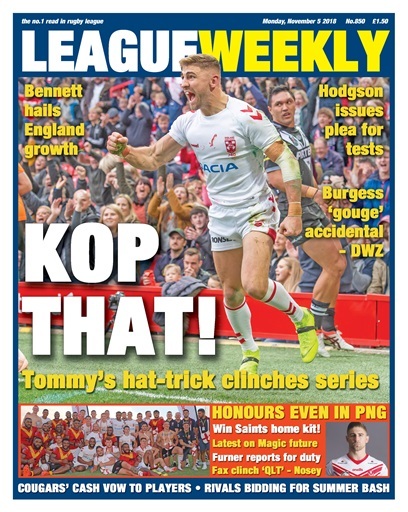 All the action, reaction and analysis as Tommy Makinson's hat-trick clinches England the series with a game to spare. John Bateman targets a whitewash at Elland Road but Michael Maguire is keen to learn lessons quickly. Wayne Bennett hails the growth of his players while try hero Makinson shares the plaudits with his teammates. 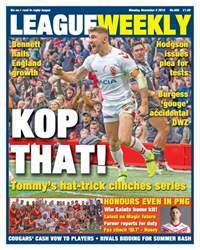 Dallin Watene-Zelezniak defends George Burgess against a claim of gouging and Josh Hodgson calls for more big tests for England in spite of club resistance. Publisher Danny Lockwood provides his analysis of the Anfield success. There's a new Saints home shirt to be won as the Super League table toppers return to pre-season... we chat to Jack Ashworth as he begins his quest to nail down a first team spot. Meanwhile, the Dave Furner era begins at Leeds – we speak to Richie Myler about his expectations, and there's an update on the deal for Trent Merrin. Salford say goodbye to one forward and miss out on a half-back, Keighley make a promise over unpaid wages, rival clubs bid for the Summer Bash and Bradford's chairman revives the Yorkshire Cup. Dave 'Nosey' Parker brings all the latest gossip - including a done deal for Halifax, news of two Saints players who may be on the way out and another signing for the Red Devils.